Does your local Walmart have the Scrubbing Bubbles One Step Toilet Kits on sale for $3.97? 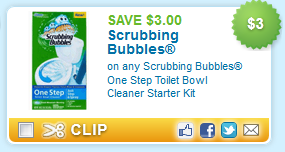 Grab this $3.00 off Scrubbing Bubbles One Step Toilet kit coupon and only pay $0.97 for the kit! Oh, and apparently you should make sure to grab the ones with a yellow stripe? Thanks to Melissa’s Bargains for this hot tip!